Another busy week here at the HQ! My pal and colleague, Anita Kirkman interviewed me and boy did we have fun. Did you miss it? You can still get the recording and the valuable tips I shared here. The best part? 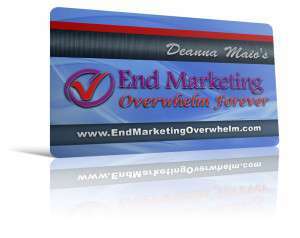 On the call, I announced the launch of my new program, End Marketing Overwhelm Forever. And I’m telling you, I couldn’t be more proud and excited about it. You see it’s the culmination of everything I’ve learned small businesses need to do to be successful. And if that weren’t enough, instead of throwing all the solutions and systems at you at once, it’s delivered in short weekly lessons. So there’s no chance you’ll get overwhelmed and frustrated. Cool huh? Check it out here. This weeks’ article is my assault on one of my biggest pet peeves, ineffective one-to-one or “get to know you meetings.” Done right they can be super powerful. Done wrong and they’re a HUGE waste of your time and energy. It’s all about getting the best results for the least amount of effort.